This simple, yet quite sophisticated potato salad is one of Delia’s creations, and as I trust her ability I didn’t actually test this recipe before I made it for a dinner party; I just knew it would be nice. And of course it was. One can always trust Delia. The only change I made was to cut down a bit on the shallots, as chopping onions really makes me cry. I think I gave up after having chopped eight shallots for double the amount of potatoes below. Adapted from Delia Smith’s recipe. Steam or boil the potatoes in salted water until soft, for approx 20 minutes. Leave to cool a little and cut into smaller pieces if needed. Meanwhile make the vinaigrette using a pestle and mortar: crush the salt coarsely, then add the garlic. Crush it, mixing it with the salt, creating a purée. Add the mustard powder and really work it in, after that add some black pepper. Then add the vinegars and really work them in. Then add the oil, but switch to a small whisk and give everything a really good whisking. Stir in the vinagrette while the potatoes are still warm and add the shallots. Add the chives just before serving. Can be served still warm or cold. Me coming home to visit is usually a good enough reason in my family to break out the bubbly and have a seafood feast! It’s important to celebrate the times we’re all together and make them special so we take every opportunity we get. It may not be seafood every time we have a feast, but it’s quite often the case. 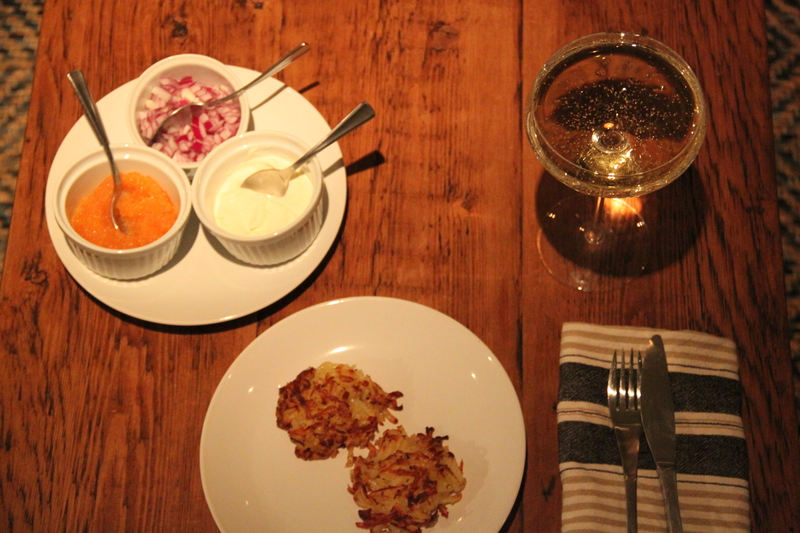 We had this fabulous meal in December when I last visited and it was just wonderful, and the type of food we enjoy cooking, and eating, together. We started with oysters, that were quite difficult to shuck without an oyster knife (we’d left it in the summer house), so we all did a few each. Good team effort, they’re quite strong the little molluscs. We had the oysters in the most simple, and our preferred, way with just lemon juice and Tabasco. What a treat! Our second course (although that sounds too fancy for peeling prawns) was smoked Atlantic prawns with home-made mayonnaise (a team effort by dad and me), which I just love. The taste is much more complex than fresh prawns and although it may sound strange to smoke prawns, it really works. We had a really nice bottle of bubbly, to drink, a Marquis de Haux Cremant de Bordeaux. It’s not readily available in Sweden, but shouldn’t be hard to find in the UK or the rest of Europe. For the main event, we had lobster. Something we usually only have as a starter, but I love it as a main course too. Again it was a team effort getting the food ready. I made the skin-on oven fries (that turned out great by the way), and was also in charge of picking the lobsters apart while mum made the lovely sauce. Good effort, team! This is our family version of lobster Thermidor with mushrooms, mustard. cognac and matured cheese and we all find it divine. When we think of something special to eat at home, this is always a contender. Most often we have it as a starter, rather than as a main, but after this meal I find it quite likely we’ll have it as a main-course more often than not. As these were fresh lobster it was almost (but only almost) a sacrilege to coat them in a creamy sauce, so we all had a claw au natural with a dollop of mayonnaise to really taste the lobster. We had a lot of lovely food over the Christmas break, but this was my absolute favourite meal. We just had such a good time cooking together and dining together. Mix egg yolk, dijon and vinegar in a bowl. Whisk it together using a balloon whisk and add the oil drop by drop while whisking. Once the mixture has thickened you can add the oil in a little trickle, whisking continuously. Whisk until you have a thick and pale mayonnaise. Season to taste with lemon, white pepper and plenty of salt. Sprinkle a little paprika on top (to decorate) before serving. Preheat the oven to 180-200C, with the fan on. Wash the potatoes and then cut into sticks. Rinse away the starch. Pour the oil into a large oven-proof tray and add the potato sticks. Add plenty of salt and pepper. Massage the oil into the potato sticks using your hands and spread them out on the tray. Bake in the oven for approx 35 minutes or until crispy, golden and blistery on the outside and cooked through. 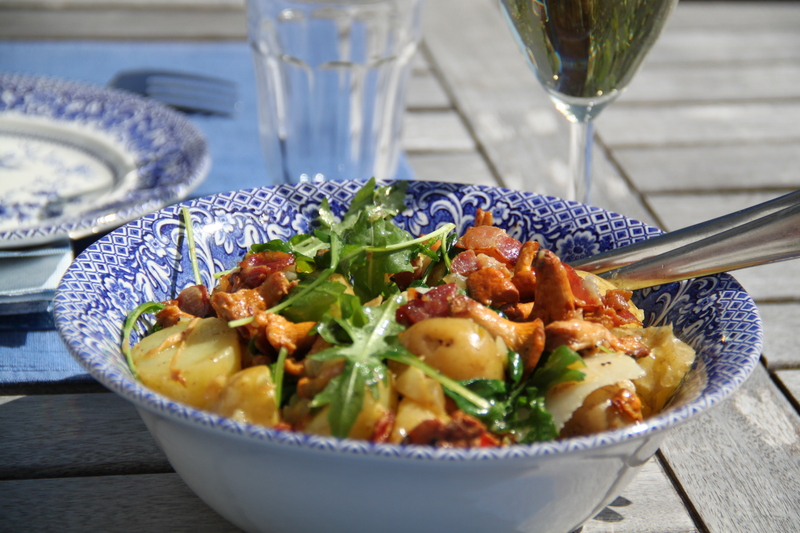 This wonderful potato salad is an old favourite. I saw a Swedish chef make it on TV many years ago and then made it myself a few times in Sweden and loved it. But moving to London girolles were no longer a staple mushroom in the supermarket so I forgot all about this dish until this summer when I cooked it for my parents. Luckily it was just as nice as I remembered it! Adapted from Gert Klötzke’s recipe. Dice the potatoes and add to a large bowl. Fry the bacon until crisp, dice and mix with the potato. Fry the onion and garlic in butter until softened, add the mushrooms and fry until golden. Season. Add the mushroom to the bowl and drizzle with the vinaigrette. Mix well and lastly add the rocket and cheese. Mix again and serve. Maybe you’re beginning to sense a theme on the blog?! Food that’s quick to make when one’s busy, perhaps? Well that’s what my life looks like right now. If I cook at all at the moment it’s either for friends or a quick supper. That’s why sometimes I cook food that’s ridiculously simple. One you don’t even need a recipe for. 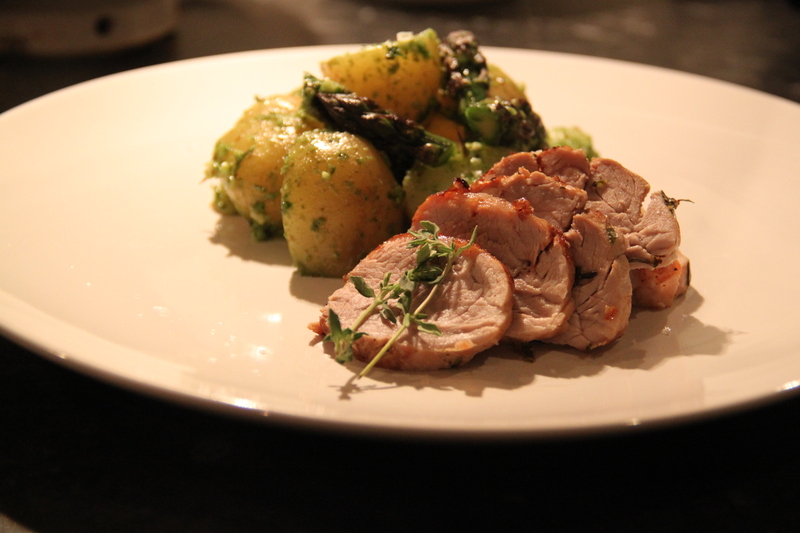 But it is still very tasty, filling and satisfying and definitely fresher than a takeaway. Boil the new potatoes. Melt butter in a frying pan and fry the (drained) potatoes golden brown. Add spinach and let it wilt. Season. 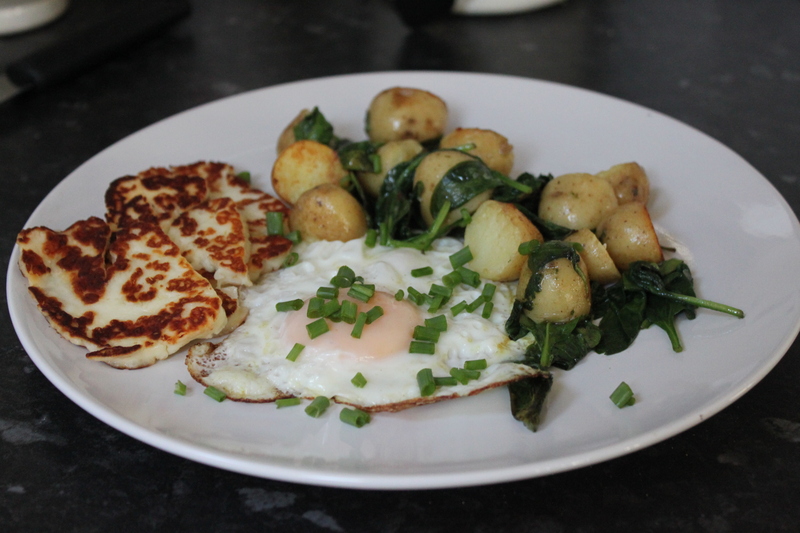 In a separate frying pan, fry an egg, remove and then fry a few slices of halloumi on high heat until golden brown. Serve.